The Global Center for Women and Justice at Vanguard University is now seeking nominations for its annual Diamond Awards that will be presented at the center’s annual Priceless Luncheon to End Human Trafficking fundraiser on September 17, 2016 at 11:30 a.m., at the Island Hotel in Newport Beach. Each year, the Diamond Award recognizes individuals, businesses or organizations, and a youth or youth group, for their tireless commitment to promoting justice for women and children affected by human trafficking. Criteria for the award include support of one or more nonprofit organizations, leadership involvement, and volunteer participation, collaboration and commitment in promoting justice for women and children. A review panel of business and community leaders, philanthropists, and Vanguard University faculty will evaluate the nominee submissions. Local individuals and organizations (nonprofit and for-profit) are invited to submit nominations by the July 31 deadline. Last year’s Diamond Award winners included Orange County Transportation Authority’s Human Trafficking Campaign “Be The One,” as well as Kyla Smith, director of The Dream Center’s Project Hope for Victims of Human Trafficking. 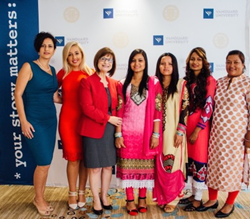 Human trafficking survivors from New Delhi, India, Pabitra Sunar, Chandrakala Badi, and Devisara Badi were also honored with the Director’s Youth Award for their work in advocacy for marginalized women in India. This year’s Diamond Award winners will be announced at the annual Priceless Luncheon to End Human Trafficking event chaired by Jasmine Shodja, where 400 attendees are expected. For 14 years, Vanguard University’s Global Center for Women and Justice (GCWJ) has provided training and resources to enable leaders to promote justice for victims of human trafficking and modern day slavery. A faith-based organization, the GCWJ carries out their mission through education, research, advocacy and collaboration with students, educators, law enforcement, healthcare and community leaders. With over 21 million people living in slavery today, the GCWJ works diligently in their efforts to end human trafficking and the cyber-exploitation of women and children in Orange County and worldwide. To attend the annual Priceless Luncheon to End Human Trafficking, September 17, 2016 at 11:30 a.m., at the Island Hotel in Newport Beach, visit http://www.vanguard.edu/gcwj.